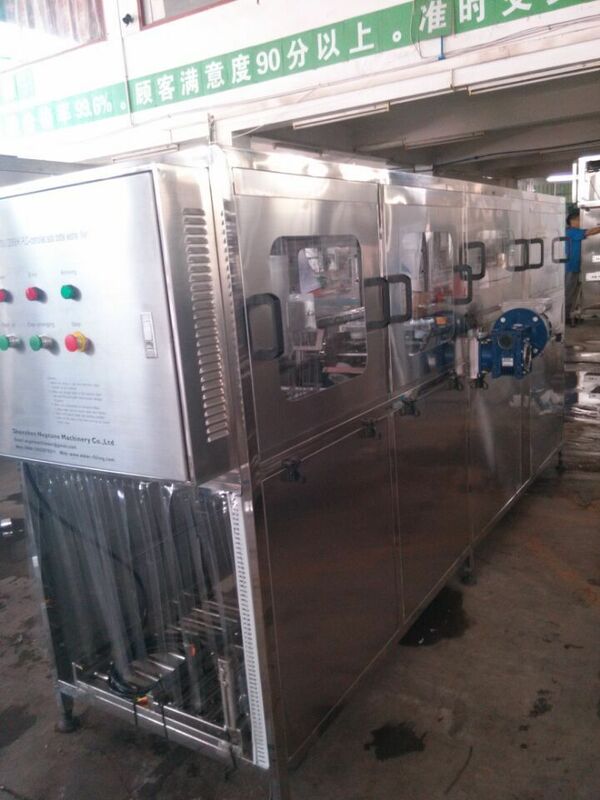 All line controlled by PLC, the water bottling machine integrates the functions of 3/5 gallon bottle washing, filling and capping on one set of machine. 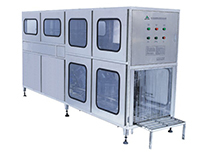 It not only have advanced technology, high automatically, easy operation and reliable performance, but also small size, small weight and beautiful appearance, anti-corrodibility, thorough disinfection, effective antipollution and high quality. The device employs key components of electrical appliances and metal materials manufactured by brand factories at China and abroad. Nonmetallic components are manufactured elaborately by wearable materials, such as nontoxic PP plastic, etc. Removed the cap > Brush washing the outside and inside of the bottle > Automatic loading the 5gallon bottle to washing filling capping machine> Automatic washing the 5gallon bottle by clean and purified water, automatic filling pure water into plastic bottle, sleeve and pressure cap on the bottled water > Cap washing and loading into washing filling capping machine > Worker sleeve a tube label at the mouth of the 5gallon bottled water, then auto sealer will heating the label, then label will shrinking and got tight sealer the bottle mouth. Washing Cap and Loader Cap Machine manufactured by our company. 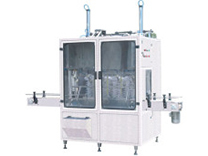 This machine, a newest practical product, is manufactured in order to consummate a complete set of product line. Water packaged in 5gallon bottle can be a very profitable business model when done properly. This is the lowest cost way to package water because of 5gallon bottle is reuse. The average cost to produce a 20liter bottled water is less than $0.1 (USD) with a wholesale price of ranging from $1 to $5. Because the 5gallon bottle is reuse. And do not worried the quality, because 5gallon bottle is use pure water washing by machine after everytime recover from customer. This is a very good markup with over 1000% profit margin, and is most successful when selling in bulk to make a good profit. No matter in developing and developed Country is use the same way. And it is very environmental protection. Every countries of the worldwide is a very high demand for safe drinking water and 5gallon bottled water is the best solution to provide safe drinking water at an affordable price. The key to having a successful 5gallon bottled water plant is to be located in an area with a population of over 25-30,000 people that lack safe drinking water. 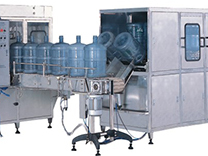 In areas with a larger population there are 5 gallon water bottling plants that are making profits well over 500,000. USD. We have established and consulted with plants in several countries where the profits range from $10,000 to over $500,000 per month. Establishing a bottled water plant can easily be a very profitable business with low start up costs! 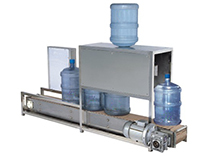 A 200BPH 5gallon bottled pure water plant could produce 1600 bottle per shift. The cost to produce each bottle is under $0.1. Many plant will run 16 or 24 hours a day in times of high demand. If selling at a $1.1 every bottle. This rate the plant could make $1600 per day in profits when selling at the lowest price possible. Profit $4800 if running 3shift everyday. How Can Neptune Machinery Help? 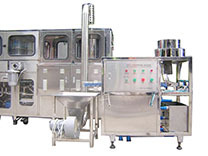 Neptune Machinery specializes in building water purification equipment such as water filtration systems to produce pure water for your bottle plant. 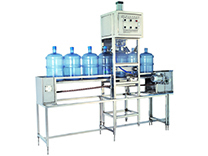 We also offer 5gallon turnkey completely water bottling plant that are currently used worldwide. We will assist you with establishing your 5gallon bottled purified water plant from the conception of the idea to when you are ready to open your plant. Please call or email us to find out more on this profitable business and to see how Neptune Machinery can help you start your operation.